While reading Tempest, the first thing that I noticed was that the author made sure to not keep things too technical. Being that Tempest is all about time-traveling, I was mentally prepared for all sorts of confusing terms and concepts to be all over the book, but while they were indeed present, Cross made sure that us readers would be able to understand the said concepts clearly. Easily understood analogies were present, and because the MC himself is in the midst of discovering his capabilities, we are also able to understand things through his eyes. I don't know about you guys, but that's an automatic plus in my book - I do adore books about science fiction, yes, but I tend to not finish them when I can barely tell what's going on. Thank God I didn't encounter that problem while reading through Tempest! After witnessing his girlfriend, Holly, get shot in the year 2009 by strangers, Jackson is unable to control his time-traveling and inadvertently jumps back to 2007. Though Jackson has learned through all the past experiments and studies he has done with his friend, Adam, is that he is unable to change the future, Jackson is willing to push boundaries and learn more about his capabilities, as well as the strangers who attacked him and Holly in the future, in an attempt to save Holly's life. As Jackson settles down in the year 2007, gets to know a younger Holly, he ultimately realizes that there are bigger things at play than he initially thought - and that the person closest to him may be the one who has all the answers to all the questions he has. 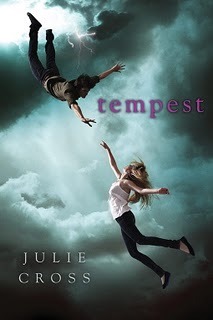 While I did enjoy reading about Holly and Jackson's romance, one thing I particularly liked about Tempest was that the romance did not overshadow the other aspects of the book. Tempest is all about Jackson and his ability to time-travel first and foremost after all, and thankfully the author didn't forget that. Furthermore, I loved how Cross made sure to give enough focus to not only Holly and Jackson's relationship in both time periods, but also Jackson's relationship with his family, and ultimately his desire to unravel the mysteries of his ability. Cross was able to successfully weave all aforementioned aspects of the story together into one unforgettable novel that has so much twists and turns! Moreover, I really enjoyed reading about Jackson. He's an easy character to like, and he has so much depth. At first glance, it seems that Jackson is your typical spoiled rich kid, but because the book is told through his POV, we are privy to his innermost thoughts and emotions - his despair at the thought of losing Holly, his guilt at not being by his sister's deathbed, his lamentations over his relationship with his father, and his sheer desperation to change the future. Jackson also grows so much as a character throughout the book, as he is finally able to gather enough courage to face the past, and to make difficult decisions concerning his and Holly's future as well. Action-packed and unpredictable, Tempest would be a nice addition to the bookshelves of both YA and Science Fiction afficionados. I finished it in one sitting - I was literally tearing through its pages because I just had to find out what was coming next! I guarantee that this is a novel that everyone can enjoy - it has science fiction, romance, sublime character development and a unique plot - what more can you ask for? I can't wait to read its sequel! For some reason I was under the impression this was written in prose, that's why I avoided it! I'll have to check this one out again. I'm glad to know the romance took a back seat to the storyline. Great review! It has a sequel, I thought it was a standalone. Now I have to read it. Great review! Great review! I have been thinking about reading this one for a while now. It sounds great and I enjoy time traveling books. It's great to hear though that it's easy to understand and doesn't get confusing. That's usually one of my biggest problems with time travel stories.